How do you choose who gets to stay warm? Before you even touch down at Mytilene airport evidence of the catastrophe on the Greek Island of Lesbos can be seen from the air. Thousands of orange and red life vests of all sizes litter the beaches. On the taxi ride into town groups of refugees line the streets with backpacks, some are still wet and have evidently just arrived. By law local taxis are forbidden from driving the refugees, but in reality many bend the rules. I share one with a Greek contractor, and after guiltily checking left and right our taxi driver ushers an Afghan man into the back seat. The generosity of the Greek people has floored me. While they are clearly angry at a lack of European solidarity, not one has shown a hint of animosity towards the refugees themselves. They are frustrated by the economic situation and by the lack of response from authorities, but no one has uttered anything even remotely close to a call to turn people back. Instead what I consistently hear is a call for safe passage. The travel agent at Mytilini bus station tells me that this is because Greeks are all too familiar with having to leave their homes. Many of them were displaced themselves during the civil war. “We have lived the same thing” she says. A fisherman points out that a child drowning looks the same whether he is Greek or Syrian. It is only distance that allows people to dehumanise. Australians are able to advocate sending people back to where they came from because these people are kept far away from them, on remote pacific islands, and only exist so far as they are part of a mass. When you see a sodden family walking through your town, carrying all their belongings on their back, no one considers physically turning them around and pushing them back out to the ocean. But in effect this is what we do. People need to realise that in practice the result is the same, geography just allows you to look away more easily. The travel agent expresses annoyance at how the refugees treat the environment, and admits certain parts of the island no longer feel like her home. But she is quick to say that there have not been any problems between them and the local population. 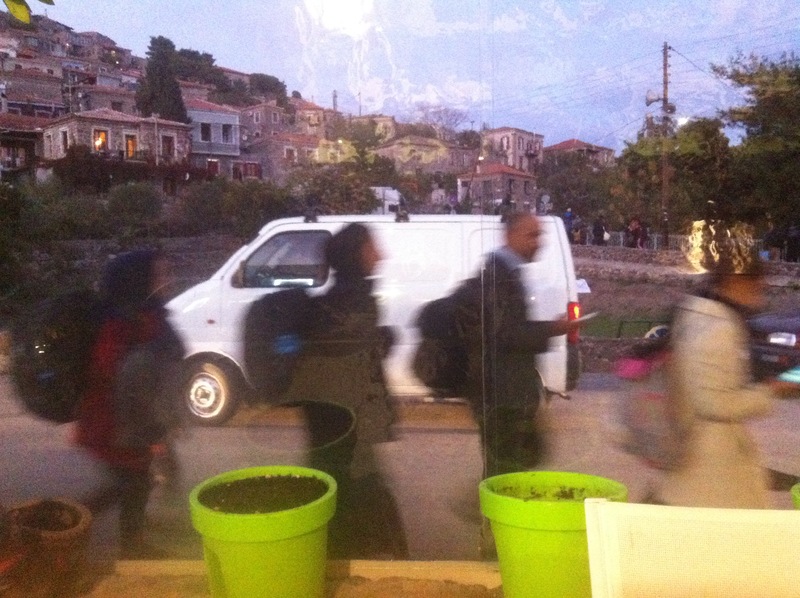 Lesbos has not seen an increase in crime, despite the thousands who have passed through. Her frustrations are practical; the economic situation, long term prospects for the tourism industry, and how Greece is going to cope with accommodating the thousands more who are inevitably going to continue arriving. 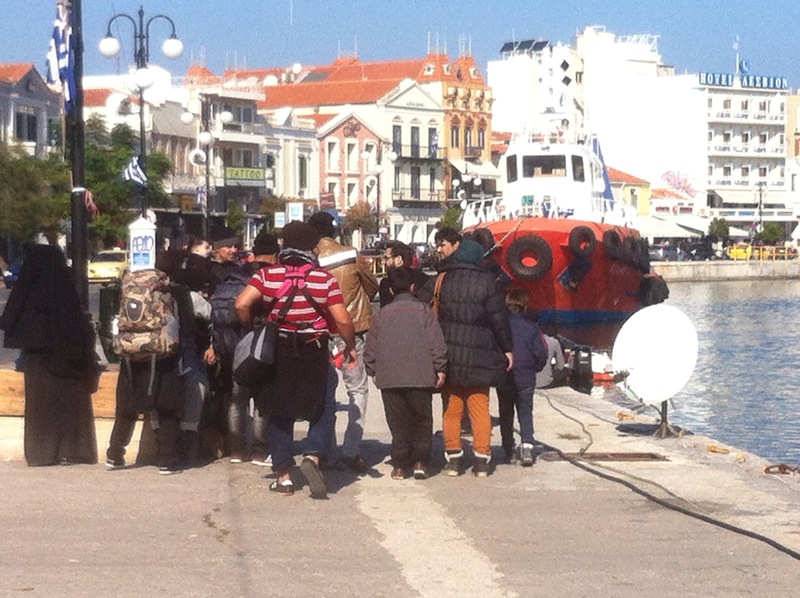 In response to demand the agency has started selling package tickets that include the ferry ride, assistance on the mainland and then a bus directly to the Macedonian border. She acknowledges that for now the refugees and influx of volunteers and journalists are keeping the economy going. But she is fearful that the tourism industry has suffered irreparable damage and the island will never regain its reputation. 4 cruise ships diverted to different islands this summer. 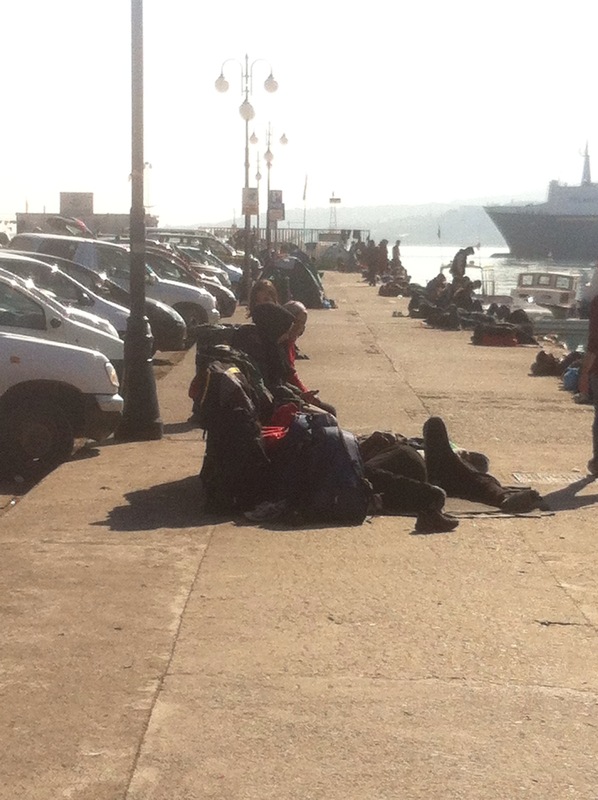 Instead of holiday makers the port is cluttered with refugees, and I admit that it felt uncomfortable. But it wasn’t so much that I felt threatened as that I felt spooked, as if it were a ghost town. These weren’t people so much as they were bodies. Empty vessels of shell shocked individuals who had breath in them but no life. They lay everywhere, some had tents and sleeping bags and napped, but none of them were present, they were just waiting. The difference in how certain groups of refugees are perceived is astonishing. 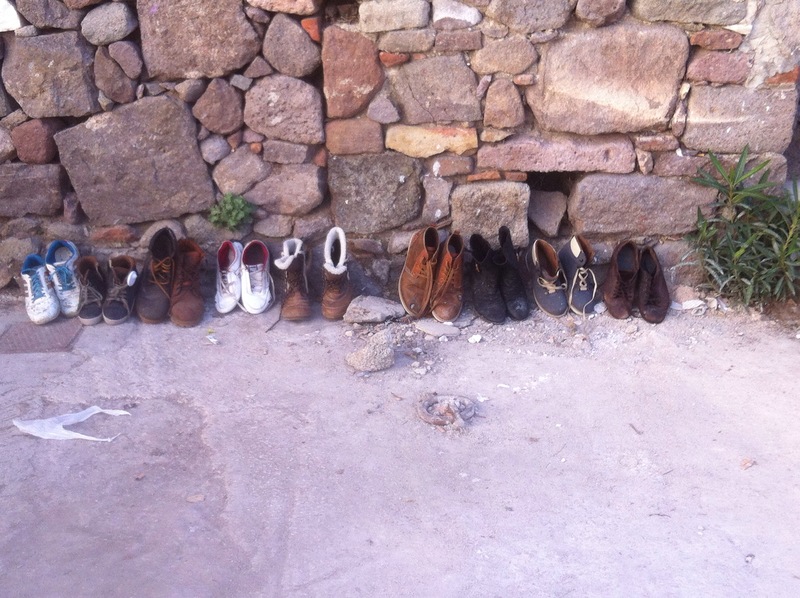 From the moment the boats wash ashore people are categorised based on their nationality. Syrians are immediately distinguished from other groups and sent to their own camp. And local empathy towards them seems greater. From what I can gather this is because they tend to have more money, which in turn gets put back into the economy and means they can move on more quickly. While the Afghans are poor and will wait around for a week until they receive Western Union transfers, I see several Syrians withdrawing cash from ATMs and eating in restaurants. Some will even pay for hotels if they can find an owner who will break the rules. They are also better educated and speak more English so can communicate with the Greeks. The bus to the north of the island where I am now was full of volunteers, and there are accents from every corner of the globe. It is the volunteers who spot the boats coming and rescue people in distress. Other than the Greek coastguard, there does not appear to be government help. NGO workers line the beach at night with lights and binoculars and are the only look outs that may pick up a boat before it crashes into rocks. The entire island has two ambulances responding to the crisis, so volunteers end up driving pregnant women and injured children to hospitals. A few days ago Tsipras was here and I’m told that almost overnight the island was spotless for his arrival. The locals want to know why such effort can’t be directed towards saving lives and organising the situation more effectively. Everyone advocates for opening the land border. The sea is clearly not deterring anyone and hundreds of lives are being lost as a result. These people know where they are going, I hear a story of a little Afghan girl who was plucked out of the ocean and tried speaking to her rescuer in broken German. The Greeks are angry with Germany for imposing austerity measures on them over the summer, and there is a keen sense that Germany owes them and is not paying its own debt. But the government and the EU are determined to maintain the appearance of Fortress Europe, despite the fact that its walls are crumbling all around.